The following has been contributed by the authors with the permission of the editors and the publishers. The views expressed do not necessarily reflect the views of the members of the CAIN Project. The CAIN Project would welcome other material which meets our guidelines for contributions. These chapters will also be available as a downloadable document which can saved and opened in 'Word'. These chapters are copyright of the authors 1992, and are included on the CAIN site by permission of the publishers. You may not edit, adapt, or redistribute changed versions of this for other than your personal use without the express written permission of the publishers. Redistribution for commercial purposes is not permitted. The ESRC Data Archive has a remit to cover the whole of the United Kingdom and we are anxious to ensure that all social and economic researchers obtain access to relevant data irrespective of their location. Because we were concerned that our coverage of the strategic datasets relating to Northern Ireland was poor, we have made a special effort over the last few months to improve our holdings of Northern Irish data. Derek Bond and his colleagues from both the University of Ulster and the Queen's University of Belfast have been very helpful in informing us of their data needs and assisting in negotiating access to data. The interest and co-operation of Northern Ireland civil servants bodes well for future research. Their willingness, and that of and academic researchers, to contribute to this special issue of the Bulletin testifies to the interest shown by the Northern Ireland research community in improving access to data. In order to encourage the use of Northern Irish data and comparable datasets, we present our readers with this special issue of the Bulletin. Since Northern Ireland provides socio-economic researchers with many interesting and often unique problems, various initiatives designed to encourage high quality research into socio-economic issues in Northern Ireland have been implemented. A major practical problem encountered by these initiatives has been knowledge of and access to secondary socio-economic data for Northern Ireland. 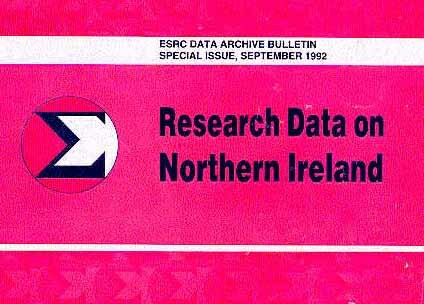 Because of its unique constitutional position the collection, collation and dissemination of most major Government surveys are the responsibility of Departments within the Northern Ireland Civil Service rather than the Imperial Civil Service. Thus, access to most Northern Ireland data needs to be negotiated separately. A result of this is the unintentional exclusion of Northern Ireland data from national data holdings. Access to many of these datasets has been possible only through 'local knowledge' which clearly hinders the development of high quality research on Northern Ireland. This shortcoming has been recognised by the ESRC and various research projects, including the ESRC Regional Research Laboratory initiative, have attempted to ameliorate the problem. With the completion of the main phase of the ESRC Regional Research Laboratories initiative, it is an opportune time to review the situation. There are many factors complicating the development of access to datasets in Northern Ireland. The legality of granting access to government-collected data, particularly prior to the implementation of the Data Protection Act, has been a grey area. 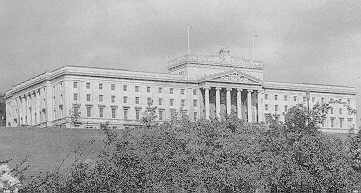 The political situation has always made the collection of social data and the normal constraints of confidentiality more pertinent in Northern Ireland than in Great Britain (as highlighted during the collection of the 1981 Census at the height of the Hunger Strikes). Government statisticians, often working under pressure, have been understandably concerned that any data released to outside analysts should be well- documented and of a uniformly high quality and have found it difficult to divert limited resources from the completion of their own studies to the preparation of datasets for outside researchers. Some of these issues are discussed in the next section by Edgar Jardine, head of the Social Statistics Division of the Policy Planning and Research Unit of the Department of Finance and Personal (NI). In particular, he gives an overview of both the organisational structures and official environment under which the Government in Northern Ireland collects and disseminates both social surveys and economic statistics. This is followed by a series of brief reviews by leading Northern Ireland academics concerning the large-scale continuous datasets for Northern Ireland. These are grouped by availability through the Data Archive. The first three on Family Expenditure Survey, Labour Force Survey and Northern Ireland Social Attitudes Survey are available through the Archive on a comparable basis with their British counterparts. The next group, the Continuous Household Survey, Crime Statistics and the Building Society and Mortgage Survey, Personal Income and Wealth Data and Demographic Data, while available in part through the Archive, have markedly different coverage and structure from their counterparts. The final two subjects, Housing and Education do not currently have comparable data available through the Archive. A common theme is the changing climate under which data are collected in Northern Ireland. The major implication of this is that datasets might continue to be inaccessible to researchers because of the need Government Departments and Agencies to charge an 'economic price' to users. This issue will re-emerge as other datasets are considered in further articles. A further series of articles, organised by the Northern Ireland Regional Research Laboratory and the Centre for Policy Research at the University of Ulster, on Northern Ireland data sources and their accessibility is planned. Datasets such as the Northern Ireland census of Population and the Postal Address File will be discussed. Also planned are articles on economic statistics, agricultural statistics, historical archive material and one-off surveys. A final word of warning to those about to embark on an exploration of Northern Ireland data is that the terms 'Great Britain' and 'United Kingdom' are sometimes erroneously used. Great Britain, of course, excludes Northern Ireland whereas the United Kingdom consists of Great Britain and Northern Ireland. Inexact usage of this terminology may lead to difficulties when trying to establish whether a dataset includes Northern Ireland.